Leigh Miners Rangers are delighted to announce buy1get1halfprice.com as a club partner for the 2018 campaign. In a unique partnership buy1get1halfprice.com will be attending home games and setting up a pop up sale shop for you to browse their quality range of clothing along with providing advertising hoarding, website and social media coverage. At Buy1Get1HalfPrice.com they are all about cheap clothes and absolutely everything they sell is buy one get one half price, 24 hours a day, 7 days a week and 365 days a year! A men’s branded t-shirt from Armani Jeans and a men’s branded hoody from The North Face, whatever is cheapest you get it for half price! A pair of men’s branded jog pants from Emporio Armani EA7, men’s branded boxer shorts from Ralph Lauren, a men’s branded fashion jacket from Crosshatch and a pair of men’s branded fashion jeans from Firetrap – The second most expensive item will be half price and the cheapest item will be half price! It doesn’t matter what order you add items to your basket, or how many items you add to your basket, let them do the maths, but don’t forget to get it whilst you can as most of their customers buy a minimum of two items, and as they buy little and often to keep their offer fresh, the stock moves fast! 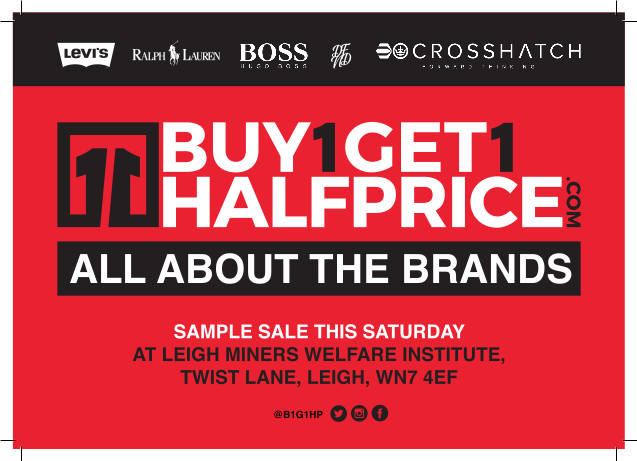 Buy1Get1HalfPrice.com is Leigh born and bred. Getting involved with Leigh Miners was a no brainer for us, a successful and proud club with strong traditions. If we can build our business on similar traditions we will do ok. When it comes to men’s cheap clothes we are big in the game, let us be your one stop cheap online clothing store! – Marc Bennett, Director. Under 18 ‘s travel to Rylands for tough physical test !